I'm a Wombler! Save Your Family Money! We save money wherever we can, and we love doing this! I never used to be so money aware until I had my own children to feed and bills to pay. Over this past year I have found many new and wondrous, even some bizarre new ways to which I can save money, even if it is only a couple of pence as well. Every penny helps! So here is my list of what I have changed in order to be more money wise! Yes folks, I am a womble! Wombling is the term for somebody who collects other peoples unwanted items or rubbish and uses them for their own gain. I first found out about wombling when a video popped up on my Facebook group. It was a video about how to womble Asda receipts. 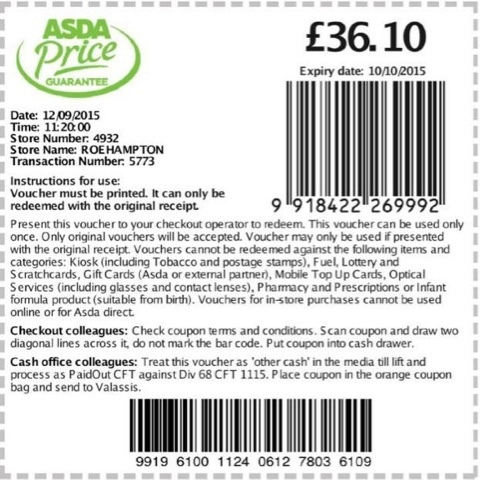 Asda have a price guarantee website, where after you have done your shop you can go on their website and by entering the code above the barcode from the receipt they will tell you whether your shop would have been cheaper at a competitors store, and if it would have been cheaper they then give you a voucher for the difference, this could be for 1p, £10 or more! Therefore by picking up any receipts you see that other people may have dropped or left in their trolleys you can then compare their shop online and possibly get a money off voucher in return. I started wombling at Asda a few weeks ago and the receipts that I have collected to date in this short period have given me money off vouchers to the total of £16.78, it really is just like picking up money off the floor! You can also womble at other stores, including Tesco, where if somebody hasn’t used their clubcard, the receipt will say you could have earned so many points this visit. If you then take the receipt to the customer services desk then can then the points onto your clubcard. Scroll down to read my Intetview with Steve, Professional Wombler. I never really thought of purposefully heading to a charity shop or such like if I needed a new outfit for example. It was my husband who first really properly introduced me to charity shops, he used to always go in for a look at the books whenever we go shopping. I was amazed at a lot of the things that you could actually buy in a charity shop. Some of the clothes and other items were actually brand new still boxed and with tags on! Since then I fell in love with charity shops! I recently had an interview for a new job and I needed a smart suit to wear, so off I went to the charity shop and bagged a black trouser suit for …£3! Other things I look for are DVDs, (mainly children’s), children’s clothes or shoes, clothes for myself, children’s toys etc. If you think about it when you go into a clothing retail store and pick up a top usually around £8/£10 you’d have to work for just over an hour in order to be able to afford to pay for that top, given minimum wage is £6.70! Now maybe its just me but that seems a bit extortionate. Ooh taboo! Second hand presents! Well for the last few Christmases / birthdays most of the gifts I have given to my children have been second hand. Am I naughty? Well im saving money, that much I know. At the end of the day if I can buy something that my child wants for cheaper than normal, then im going to. If they see something they want, then I will go online to see how much it is and then I will go onto eBay to see if I can find it cheaper. So long as the gift is in working order and good condition they don’t care if it doesn’t come in the original box. They still got the toy they wanted. Iv started to seek these out in my local supermarket and I now know where they are kept and at what times they put out the fresh stock of yellow sticker items. Yellow sticker items are items that have been reduced in price because the original packaging has been damaged or food is nearing its use by date. Just recently I had a large chicken for £2.52, Felix cat food box of 12 pouches reduced from £3.50 to £1.50 and a box of coco pops cereal for £1 because the box was broken. This can range from digital goods to kids toys and clothing as well as gardening supplies. Most supermarkets hold sales from time to time, but most also want to sell off there current stock in order to get new stock in. There for look out for the clearance sections. I recently bought two terracotta pots for 15p, two kids spades for 25p, and two kids gardening kneeling pads for 25p each, what a great way to keep the kids entertained with a spot of gardening for less than £2! In previous years I also bought a Fujifilm Digital Camera down from £199 to £50! Here is a quick interview with Stephen AKA The Man in the Hat, this is where I first heard about wombling. How did you first learn of wombling? I started wombling by accident 5 years ago after seeing an Asda TV advert about the price guarantee. I’m a charity fundraisier for Cancer Research UKwww.justgiving.com/stephenauker and pledged to try raise £50,000 for them. I stumbled upon an Asda receipt blowing in the wind and picked it up and forgot about it. Several days later, I found it and checked it on the Asda website and discovered I’d just found 38 pence for no effort at all. I was soon raising around £50 a month for the charity and got noticed bt Martin at Money Saving Expert, who wrote a page about me.http://www.moneysavingexpert.com/news/shopping/2011/03/the-wombler-who-donates-from-asda-and-tesco-bins and this was the first time the term wombling was used anywhere online. What has been your best womble to date? 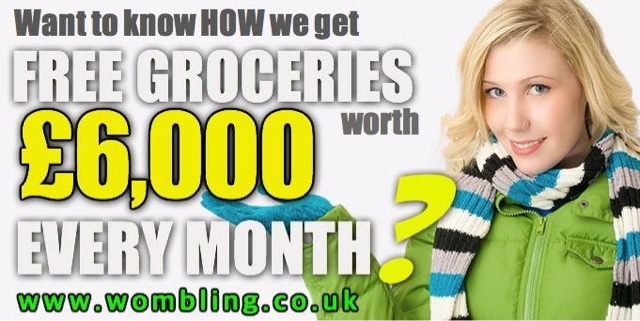 My best ever single womble is only £12.87 and I average £100 a month. but you will have seen people in the group who make more than that. The biggest single womble I have seen was this last week (photo attached) but within hours I saw one for double that amount. The top 20 womblers in our group make £6,000 a month and this month we will beat that figure. I tried to bring this hobby to the masses 4 years ago and every laughed at me. It was only this year that everyone became interested because it’s tough times right now. To some families – it’s a lifesaver, to others its a hobby. To me it’s about the charity and a bit extra for my granddaughter. Do you have any advice you can offer to new womblers? Make sure you know WHERE you can womble and not get into trouble. It’s NOT illegal to womble but most staff at the places we womble dont know their own terms and conditions. Our group admin specialise in knowing EVERY single term and condition and can always offer support and advice to members ESPECIALLY if they encounter a problem. My group is the ONLY money saving group with tuition videos, help files, wombling experts, plus we support a charity AND we have a good relationship with Asda in particular (which may suprise people). Very interesting read! I've heard of people picking up receipts to get the online vouchers, but didn't know it was called wombling! Once you start it does get s bit addictive and Iv even noticed I'm looking for receipts wherever I go! Wow, I've never heard of or thought of this receipt thing – clever! Love that it's called wombling! This is brilliant reading for a spend thrift like me! I'm a terror and need to womble a little more. Especially like the idea of purposefully shopping in charity shops – I like it for vases and jewellery and such but should make an effort to check them out more often! Glad you enjoyed reading it Hayley always worth popping into to have a look whenever you can. You never know what bargains or lost treasures you might find! That's great to know, really interesting. I actually happened to catch a youtube video all about this a few months ago. I try and be frugal but I must admit I haven;t yet tried it. I really should do.